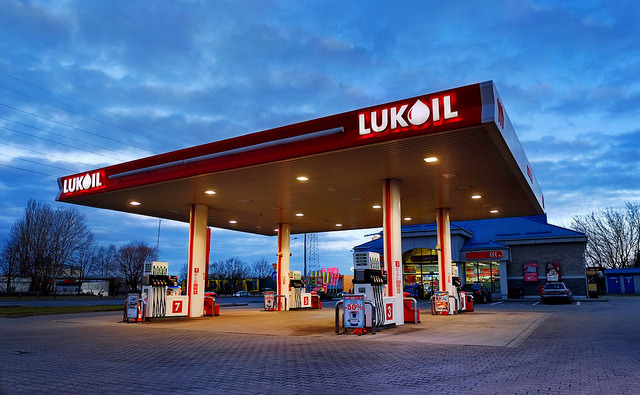 A gas station from Russia’s second largest oil producer, Lukoil, on Aleja Włókniarzy street in Łódź, Poland. By Rafal Zych. Oil is the world’s most widely traded commodity and the key input for the projection of military force. Despite its obvious international import, most research on the political effects of oil has been domestically focused, asking questions like whether oil curbs democracy, exacerbates human rights abuses, precipitates civil conflict, or reduces women’s participation in politics. Erika Weinthal, Lee Hill Snowdon Professor of Environmental Policy at Duke University and author of Oil Is Not a Curse: Ownership Structure and Institutions in Soviet Successor States (with Pauline Jones Luong). Hendrix: Everyone here has contributed to our stock of knowledge about how oil prices affect domestic politics in oil-exporting countries. Increasingly, however, our understanding of oil’s political impacts is extending to the foreign affairs of both major exporters and major importers. What do you think are the most important ways that global oil markets affect international relations? Ross: A lot has been learned in recent years about the politics of the resource curse. One of the most exciting new topics is how oil wealth affects international cooperation. One pathway is analyzed in new research by Colgan, Braithwaite, Caselli, Morelli, and Rohner, and others: how oil wealth can help trigger interstate conflicts, sometimes under surprising conditions. A second pathway is explored by Ross and Voeten. We show that countries with more oil wealth are less cooperative in many less obvious ways—they are less likely to join international organizations, to accept the compulsory jurisdiction of international judicial bodies, and to agree to binding arbitration over investment disputes. But there may be a silver lining: when countries are more dependent on oil imports—and hence have higher levels of economic interdependence—they tend to be more cooperative. Colgan: I think there are really two key ways oil markets affect international relations. First, they shape the foreign policy intentions of oil producing states, via the resource curse. By reducing domestic accountability, oil income gives autocratic regimes an incredible amount of autonomy, meaning a free hand in foreign policy. That allows them to engage in all kinds of military adventurism if they are so inclined. The second way is more straightforward: oil booms provide money for big military expenditures. The combination fuels what I call petro-aggression. Hendrix: Which governments have been most adversely affected by the drop in oil prices? Alternately, have there been any particularly big winners? Weinthal: Boom and bust cycles have become all too familiar for countries rich in oil and gas. When oil prices drop quickly, countries that rely upon oil revenue to fill state coffers instead of taxation are particularly vulnerable to dwindling revenue. More so, countries that have failed to save during the boom cycle to cover budgetary shortfalls and continue lavish social spending are more prone to economic instability. With this in mind, the drop in oil prices tremendously affects countries such as Russia, Saudi Arabia, and Iran. Whereas Russia set up a Stabilization Fund in 2004 to allow it to limit inflationary pressures and stabilize the government budget, the current drop in oil prices compounded by Western sanctions owing to the crisis in Ukraine, has forced it to not only drain its Reserve Fund but dip into the National Welfare Fund (N.B. the Stabilization Fund was split into two in 2008). Without expensive oil to feed its state coffers, Saudi Arabia is also facing constraints on social spending, further undermining the social contract that has allowed the government to exchange political support for the provision of social benefits and state employment. Thus, at the same time that countries with state ownership over their oil reserves are more likely to feel the negative effects of the steep drop in oil prices, the expansion of unconventional energy (shale gas and tight oil) over the last decade, primarily in the US, has meant that the US is also feeling the effects of low oil prices. Ross: Not surprisingly, the countries most dependent on oil exports also have been the most damaged by the price crash. This includes all of the Middle Eastern oil exporters, along with Venezuela, Angola, Azerbaijan, and Russia. Countries with larger, better-managed stabilization funds—including the Gulf states and Norway—are doing a better job coping with the fiscal consequences, and making the necessary adjustments to their budgets. Those that failed to save when prices were high are in terrible shape. So are countries that were dependent on oil exports but still had low incomes, like South Sudan and Yemen. Venezuela has replaced Nigeria as the new poster child for the resource curse. Hendrix: The winners, at least in the short term, are industries for which oil is a key input—and there are many, ranging from agriculture to transportation (airlines, automobiles)—and net import-dependent countries that don’t rely on demand from oil exporters for their exports: the Eurozone comes to mind. China, a major importer, is benefitting as well, though the benefits are being masked by more general debt- and output-related issues there. It’s hard to imagine that situation being better, however, with $100 oil. Hendrix: Why haven’t falling oil prices cowed Putin’s ambitions in Eastern Europe and the Middle East? From Donetsk to Damascus, Russia seems to be maintaining a forward military posture in spite of a drop in government revenues and the prospect of a longer term loss of market access in Europe, as its major natural gas consumers there seek to diversify supply. Weinthal: Russia’s incursion into Syria can be interpreted in a number of ways. 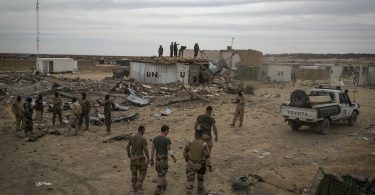 As is often the case with impending domestic crises, foreign military operations can help to deflect domestic unrest. In the short term, despite low oil prices making it costly to maintain expanding the military budget, Russia’s military operations into Syria have managed to sway public opinion in favor of President Putin, feeding growing nationalist sentiment in Russia. That Russia’s foray into Syria was seen as short-lived, with President Putin announcing a swift exit, further demonstrates Russia’s relevance as a major player to be reckoned with in the Middle East, especially in the eyes of the Russian public. Hendrix: Diversionary war theory rears its head! Colgan: The link between oil prices and aggression by petrostates is complicated. I find at least partially persuasive Cullen Hendrix’s evidence that petrostates tend to get more aggressive when oil prices are high. But I doubt it’s a tight correlation, and in some circumstances, the opposite might be true. Falling oil prices might make leaders of petrostates more aggressive if they are looking to get a foreign policy “win” to boost their flagging legitimacy back home (where low oil prices hurts the economy, making them unpopular). Also, the military investments and purchases made during oil booms are still available when the oil price falls, further enabling adventurism. Russia’s military intervention in Syria is one recent example but not the only one—witness Saudi Arabia in Yemen, too. Hendrix: I think my findings are a little more persuasive (shocker), though the Russian example could be taken as dispositive. That said, Russia’s recent meddling in Crimea began in earnest in March 2014, when oil was still over $100 per barrel. Besides, Russia is an outlier case. Admonitions to view it as an ordinary petrostate aside, it’s the only petrostate that has major power status and a sphere of influence that extends both into Europe and the Middle East. Hendrix: Where do you see prices going in the next year or so? Jeff, you in particular have been vocal about the inability of OPEC to control production. Are we entering a period where there will be no one at the wheel, so to speak, driving production decisions or prices? Colgan: Predicting oil prices is a mug’s game. If forced to guess, I’d say that prices don’t fall much lower than $35, as various high-cost producers are driven out of the business and supply falls. I also expect prices stay below about $100, because US shale would kick into high gear as prices rose, thereby offering more supply. But I have low confidence in all of this, and certainly short-term blips outside these bounds could happen. At any rate, global oil is indeed a boom-and-bust market without any regulating body. OPEC has declared that it will let the market work, which is no surprise to those of us who doubt that it has had much market power since the late 1970s—as I’ve argued repeatedly. Hendrix: What is the most pressing energy-related issue that will face the next US president? Ross: Navigating a world of financially impaired and politically unstable oil exporters. Over the past decade, many oil-funded governments—including Russia, Venezuela, and Saudi Arabia—have responded to signs of unrest by showering their citizens with rents. The stable regions in Iraq are deeply dependent on oil money. Without this funding, the oil states will grow less stable. They will also lose much of their international influence—and we know that sudden and unexpected shifts in influence can have dangerous consequences. Colgan: Climate change is by far the most important-but-not-urgent energy issue for the next US President. The scientific evidence gets scarier by the day. Weinthal: Without a doubt, climate change is the most pressing energy-related issue facing the next US president. While politicians often prefer to divorce climate change from discussions of energy politics and security, the two are inextricably intertwined. The December 2015 Paris Agreement has had a ripple effect across the globe as both developed and developing countries are now required to take action to reduce global greenhouse gas emissions. At a time that the US has yet to fully emerge from an economic slowdown, in order to address climate change, the next US president will need to decide how to undertake meaningful steps to have a serious reduction in CO2 and methane emissions to the atmosphere. There will still be many naysayers and opponents to the Paris Agreement in the US, but if the new US president wants to maintain a renewed leadership stance in the climate arena along with Europe and China, the next administration will need to ensure that climate change and energy are discussed in tandem. At a minimum, this will require continued investments in clean energy projects and partnering with China to reduce emissions and transition away from dirty industries and fossil fuel.